Erica from Northwest Edible Life (link in my blog list on right) stated in a recent post that her favorite garlic is a variety called Music. It was accompanied by a picture. The head was the size of her palm. And the cloves were enormous. I found Boundary Garlic online and I waited until the shopping cart opened on the 15th. They said this would be the best way to ensure my selection. By the time I went online in the afternoon, they were completely sold out. Shoot. I went on a Google hunt and found Botanus had Music and placed my order. I had such great luck with garlic this year, I can't wait to see how this goes. Music is the garic we plant..it's delicious...no complaints. Good to know Jane. I really an thrilled that I was able to grow garlic my first year of gardening. Do your Music turn out really huge? I would like to try this one. 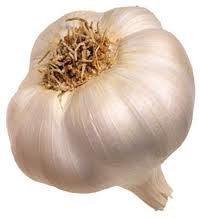 Do I need another garlic variety...no...but now you have me wanting this one!!! And the name of course, helps considerably..making me yearn for music..'be the food of life'. I guess 'need' is a relative thing. Hee hee. I read this post from Erica at Northwest Edible Life and I was hooked!! Look at the size of the cloves in her hand. Wow!!! I don't know why, but I can't paste into messages in my ipad. Weird. I am going to post the link right into my post.